The weather is depressing at the moment. The winter grain crops are nearly ready to be harvested but the rain has made the ground soft, too soft for machinery. In this painting the storm clouds are dark purple and the ground is gold. There is a reversal of tonal values. Normally the sky is the lightest area of a painting. The colour range is larger than normal for me. There were 6 colours used. Cadmium Red, Cadmium Yellow and French Ultramarine & Cerulean Blue. Viridian Green and Raw Umber are also in there. The painting is 17″ x 14″ and was painted in about 2 and a half hours. Most of that time was in weaving a pattern of suggested detail, especially in the foreground. The corn swaying in the breeze can’t really be expressed visually. Photography has influenced the way we view realist paintings. A slow exposure photograph would result in a blurred image which we have been conditioned to associate with movement. Its an abstract image as the real world does not have ‘blurred’ objects, regardless of how fast the movement is. So the pattern of jagged brush strokes in a multitude of colours and tones is an attempt at producing a ‘feeling’ of chaotic movement. The sky also has diagonal patterns to induce a feeling of energy. So this ‘peaceful’ scene (on the surface) is the aftermath of a thunderous rain and hail storm. The ground is waterlogged and the crops are battered down, and there is more to come. As usual I’ve recorded the painting and will post next time. See you then. 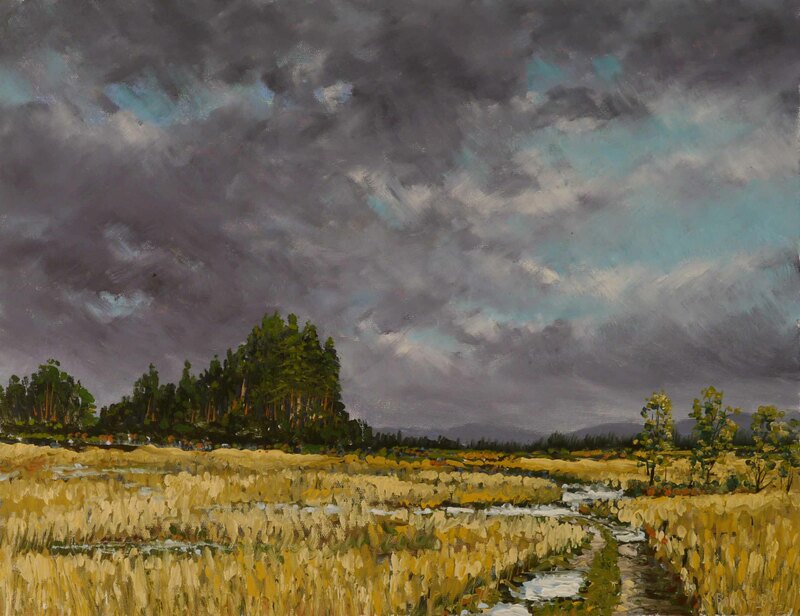 This entry was posted in Oil Painting and tagged Art, Clouds, Culture, Education, Harvest, Inspiration, Irish landscape, Oil Painting, Oil Painting Instruction, Oil Painting Landscape, painting, Pictures, Rain, Sky, Storm, Summer, Water, Weather. Bookmark the permalink. This is beautiful. I love the dramatic colors & the turbulence of the sky. It reminds me of my childhood in Indiana. Well done! Thanks Kimby. Its nice you were ‘home’ for a little while in the painting. Thank you. ‘Long break from the rain’ – some chance! I Like this one, although I feel (in the photograph) the sky and the ground are two separate paintings – I know we have different light over here (Australia) but the undersides of clouds, even stormy clouds, tend to reflect a little of the colours of the ground beneath which helps to link sky and ground while also giving the feel of the space between. Hope you didn’t mind the comment. I always enjoy your blogs. Its an interesting point and one which I’ve mentioned before, that is, depicting natural phenomena in a painting (here). Ireland’s light is renowned among artists and photographers. Some of the photographs of Irish landscapes on Flickr look surreal but because they are photos they are believable. A painting of the same is suspect. This scene is typical of an Irish Summer. The intense light is blinding, under a very dark sky. Thanks for the observation and comment. 1949? I’m not surprised you don’t remember. Beautiful piece, my favorite, for all of the reasons you articulated so well. Thanks Elena, I’m glad you like. This is so evocative of my American Midwest (even if it IS Ireland)! I have tried on a few occasions to get that wonderful contrast of purple-gray sky and green-yellow landscape but have never succeeded the way this painting does. Will have to give it another go after seeing this painting! Thank you. My next post will include a video of the actual painting process. This might also be helpful. This painting moves and has space. Nothing sullen or melancholy here, but only charged with emotion and life. Nicely done. Ooo, yeah, I agree. Like it’s about to pour any minute. So much energy. Gorgeous picture. Sorry to here about your weather. Here in Kentucky USA we have had over a week of 100 degree weather and we will continue that until next week. It is so bad that our grass has turned brown and many plants are almost gone. Good thing I did not plant a veggie garden this year. That would make life too easy. Thanks for thinking of us. Pingback: Wind and Rain | Daily Paintings and Drawings by James Murch.